My motto: The better the ingredients the better the cocktail! That really applies to all aspects of cooking, whether it’s wine for a main dish, vanilla for baking or tequila for a margarita. That said, you don’t have to run out and buy an expensive tequila for this drink. But let’s talk about tequila a little bit. 100% Blue Agave tequila is going to be the best tasting and you can find some decent 100% Blue Agave tequilas on the market for a reasonable price. So this is a recipe inspired by the Classic Margarita recipe I found in a cookbook called Margartias 101. I made it my own by tweaking some of the ingredients, namely using a non-alcoholic triple sec for the Cointreau. Just because a drink has more alcohol doesn’t mean it’s a better drink. It’s just more expensive and Cointreau is an expensive ingredient. First you need to make a simple syrup. It’s called simple syrup because it’s so easy to make. There are a few ways to make it but I make it using equal parts sugar and water. Bring to a boil over high heat and boil about 1 minute. Remove from heat and cool. Refrigerate any leftover. I make this for my husband to sweeten his iced tea. Now for the margarita recipe! Combine tequila, simple syrup, triple sec, and Key lime juice in a cocktail shaker filled with 1/4 cup ice. Don’t use crushed ice, it will melt quickly and dilute your cocktail. Shake vigorously. 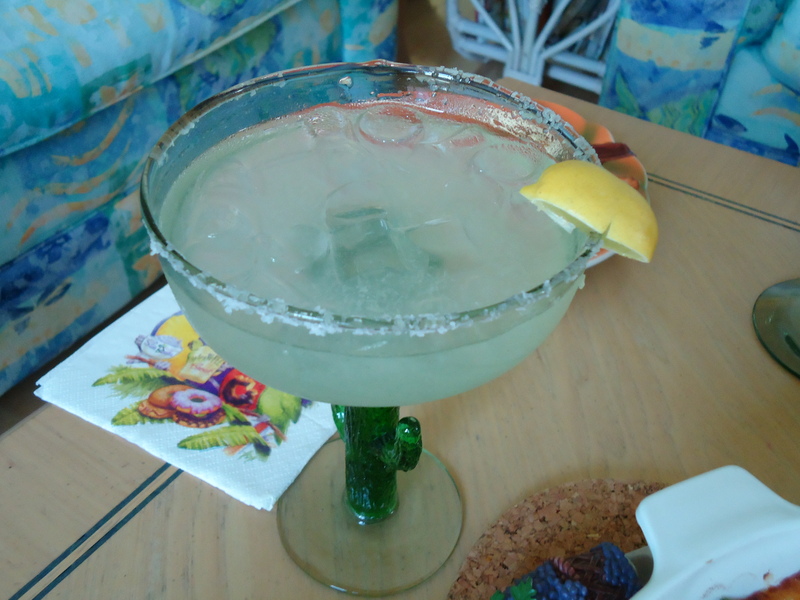 Pour with the ice or strain into a margarita glass that has been rimmed with salt. Garnish with a lime wheel or wedge. Pour a fair amount of Kosher salt into a shallow plate. Take a Key lime wedge and run it around the rim of the margarita glass. Dip moistened rim into salt and Viola! A salted rim! This entry was posted in Cocktails, Entertaining. Bookmark the permalink.